[S185] Concord, Massachusetts Births, Marriages, and Deaths, 1635–1850, 12, Thomas Brooks b.; 15, d.
Findagrave.com, memorial #52974480. Photo by R.D. & E.S. [S185] Concord, Massachusetts Births, Marriages, and Deaths, 1635–1850, 32, Joshua Brookes b. [S41] General Register of the Society of Colonial Wars, 1899–1902, 578. Hereinafter SCW General Register, 1902. [S185] Concord BMD, 83, Joshuah Brooks/Lydia Wheeler m.
[S572] William Gray Brooks, "A Genealogical Account of the Brooks Family," 70. [S185] Concord BMD, 171, Lydia Brooks d.
[S188] Vital Records of Lincoln, Massachusetts, To the Year 1850, 96, Dea. Joshua Brooks/wid. Mary Wheeler m.
[S188] Lincoln VR, 156, Dea. Joshua Brooks d.
[S188] Lincoln VR, 156, Mary [Munroe] Brooks d.
[S188] Lincoln VR, 156, Dea. 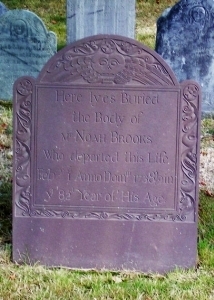 Joshua Brooks, 156, Mary [Munroe] Brooks d. (g.s. ); Lydia Brooks d. (g.s.). [S148] FindAGrave.com, memorials #52974480, #52654742. [S185] Concord BMD, 83, Lidia Brook b. [S185] Concord BMD, 91, Dorothy Brooks b. [S185] Concord BMD, 102, Joshua Brooks b. [S185] Concord BMD, 108, Lois Brooks b. [S185] Concord BMD, 114, Ephraim Brooks b. [S185] Concord BMD, 118, Hephzibah Brooks b. [S185] Concord BMD, 128, Martha Brooks b. [S185] Concord BMD, 134, Timothy Brooks b. Front of 2002 replica stone. Findagrave.com, memorial #20670785. Photo by Bill Boyington. 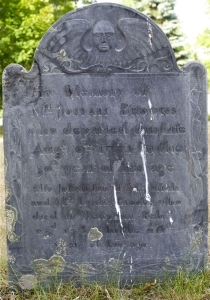 [S53] Gravestone, recorded 21 Aug 1996: d. 1 Feb 1738 [1738/9], 83rd year. [S282] John Brooks Threlfall, "Thomas Brooks," 11: "about 1656 in Concord." [S83] Henry Bond, Watertown Genealogies, 2:721-2. [S221] Clarence Almon Torrey, New England Marriages, 103, Noah Brooks/Dorothy Potter. [S282] Threlfall, "Thomas Brooks," 11. [S516] Charles Edward Potter, Old Families of Concord, 13, Luke and Mary Potter, Dorothy [543. ]: 1685. [S106] NEHGS Register, "Lexington, Concord and Weston Documents," 12:20. [S185] Concord, Massachusetts Births, Marriages, and Deaths, 1635–1850, 143, Noah Broks d.
[S185] Concord BMD, 415, widow Dorothy Brooks d. (c.r.). [S53] Gravestone, recorded 21 Aug 1996. [S148] FindAGrave.com, memorials #20670785, #24096934. [S2362] David Leigh Brooks, personal communication, 13 Jun 2018. [S2363] Concord Gravemarker Data, OHBG-338, Mrs. Dorothy Brooks. [S282] Threlfall, "Thomas Brooks," 11: "He was selectman in 1702, 1704 and 1709." [S185] Concord BMD, 34, Dorothy Brookes b. [S185] Concord BMD, 32, Joshua Brookes b. [S185] Concord BMD, 34, Ebenezer Brookes b. [S36] James Savage, A Genealogical Dictionary, 1:261. [S83] Bond, Watertown Genealogies, 2:722. [S185] Concord BMD, 45, Benjamin Brookes b. [S185] Concord BMD, 47, Mary Brookes b. [S185] Concord BMD, 51, Thomas Brookes b. [S185] Concord BMD, 60, Elizabeth Brookes b.
Findagrave.com, memorial #52654742. Photo by John Glassford. [S185] Concord, Massachusetts Births, Marriages, and Deaths, 1635–1850, 39, Lidiah Wheeler b. [S188] Vital Records of Lincoln, Massachusetts, To the Year 1850, 156, Dea. 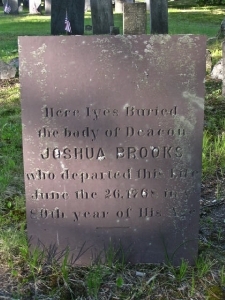 Joshua Brooks d.
Findagrave.com, memorial #35405244. All Rights Reserved - ©2017 - Patrick A. Timlin. [S185] Concord, Massachusetts Births, Marriages, and Deaths, 1635–1850, 105, Josiah Brooks b. [S357] Vital Records of Westford, Massachusetts, To the end of the year 1849 , 141, Josiah Brooks/Lydia Heywood m.
[S357] Westford VR, 267, Josiah Brooks d.
[S357] Westford VR, 267, Mrs. ____ Brooks d. (p.r.). [S148] FindAGrave.com, memorials #35405244, memorials #35405377. [S357] Westford VR, 17, Lydia Brooks b.; 267, d.
[S357] Westford VR, 17, Josiah Brooks b. [S357] Westford VR, 17, Lydia Brooks b. [S357] Westford VR, 17, Hannah Brooks b.; 267, d.
[S357] Westford VR, 17, John Brooks b. [S357] Westford VR, 17, Daniel Brooks b. [S357] Westford VR, 17, Mary Brooks b. Signature of Daniel Brooks from his will. In 1938 the Historic American Buildings Survey conducted by the National Park Service made both photographs and measured drawings of the "Daniel Brooks House," on Brooks Road, Lincoln. Will and probate file of Daniel Brooks, #2808, Middlesex County files. "Daniel Brooks House" photographs and drawings, Historic American Buildings Survey, 1938. [S185] Concord, Massachusetts Births, Marriages, and Deaths, 1635–1850, 11, Danill Brooks b. 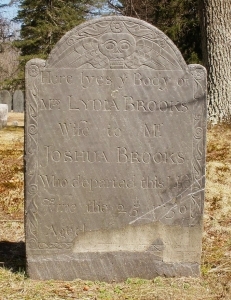 [S185] Concord BMD, 36, Daniel Brookes/Anne Miriam m.
[S282] John Brooks Threlfall, "Thomas Brooks," 9. [S83] Henry Bond, Watertown Genealogies, 2:720. [S475] Roy I. Brooks, "The Mortimer Wilson Brooks Line, 1610-1985," 2. [S185] Concord BMD, 127, Ensign Daniel Brooks d.
[S2363] Concord Gravemarker Data, OHBG-349, Ensign Daniel Brooks. [S185] Concord BMD, 195, Anna Brooks d.
[S185] Concord BMD, 56, child of Daniel/Anna Brooks b., d.
[S185] Concord BMD, 39, Samuel Brookes b. [S185] Concord BMD, 41, Anna Brookes b. [S185] Concord BMD, 45, Job Brooks b. [S185] Concord BMD, 48, Mary Brookes b. [S185] Concord BMD, 52, John Brookes b. [S185] Concord, Massachusetts Births, Marriages, and Deaths, 1635–1850, 14, Anna Meriam b. [S185] Concord, Massachusetts Births, Marriages, and Deaths, 1635–1850, 111, Lydia Heywood b.